Open the Storage Infrastructure view. In the working area, click Add Storage. In the displayed window, click Hewlett Packard Enterprise and select 3PAR StoreServ. Open the Storage Infrastructure view. In the inventory pane, right-click the Storage Infrastructure node and select Add Storage. In the displayed window, click Hewlett Packard Enterprise and select 3PAR StoreServ. You can use this method if at least one HPE 3PAR StoreServ storage system is added to the backup infrastructure. Open the Storage Infrastructure view. 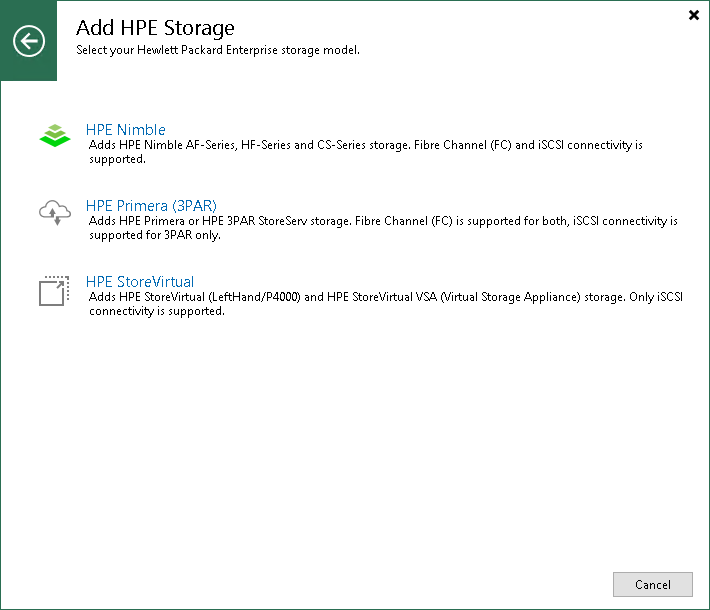 In the inventory pane, right-click the HPE 3PAR StoreServ node under Storage Infrastructure and select Add storage. You can also select the HPE 3PAR StoreServ node in the inventory pane, right-click anywhere in the working area and select Add storage.